They are both in "as new" condition, one has never been shot, the other has had a handful of rounds through it, to be honest I can not tell which is which? So basically they are both in "new condition". 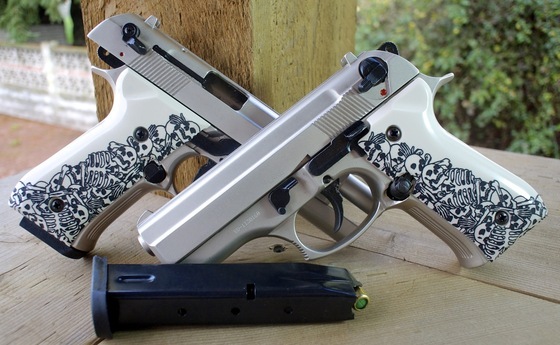 Both EKOL Dicle's are being sold with customized Hogue grips but I will include the original grips with them. Both come in the original cases and with the flare adaptors. 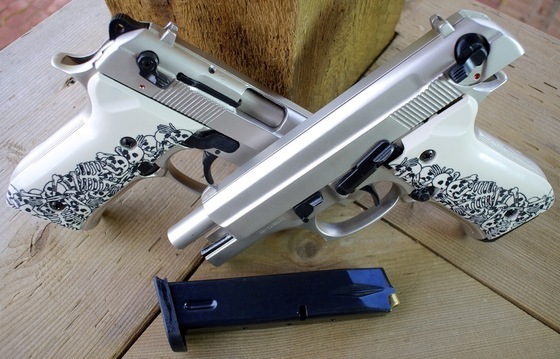 To place a bid to purchase one or both of these very nice EKOL Dicle Blank Pistols, you will need to Email Me Here with your highest bid. I will contact the winning bid at the end of the auction and send them a PayPal request for the total amount including $17.99 Shipping/Handling along with their local tax rate. The winner will have till the end of the day to pay or I will move on to the next highest bidder. This auction will conclude on Friday November 16th Midnight so act fast! I haven't had a blank gun Silent Auction for a few months now. Not too many people are willing to give theirs up here in Canada. Today I am featuring two very good condition EKOL blank guns, both front firing and in Satin finish and both full size and full weight 15 round double stack semi auto shooters. 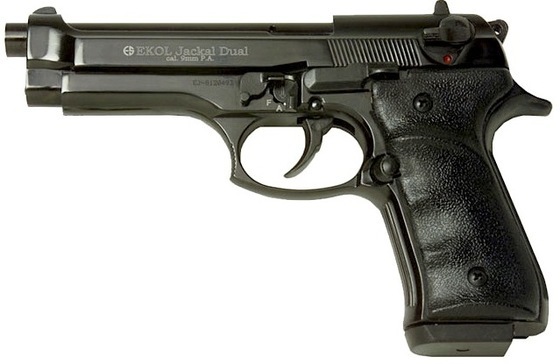 The EKOl Dicle is semi auto only while the Jackal Dual has a selector switch for shooting in semi auto or full auto. The EKOL Dicle comes with it's original hard shell case, manual and flare adaptor while the EKOL Jackal Dual does not have a case but does come with a flare adaptor. Remember the Silent Auctions for blank guns are primarily for my Canadian customers as blank guns are very hard to come by here in Canada. If you are interested in bidding on one or both of these guns, please send me an email with your highest bid to mike@replicaairguns.com. This Silent Auction end date is August 24th at midnight so get your bids in ASAP. If you are US based you can order a front firing EKOL Blank gun from my US Replica Airguns Store. Time is runnig out! Just in cased you missed my EKOL Arda & Dicle - Bruni Mod. 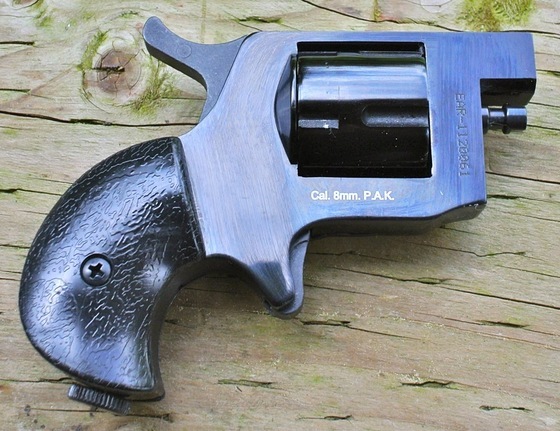 92 PAK Blank Gun Silent Auction video last week or perhaps didn't get a chance to bid on anything, this is your last chance as this silent auction ends tonight at midnight (Friday May 11th). You can check out the original post and watch my YouTube video for these items located here. Another great opportunity for some of my Canadian based customers to get yourself a blank firing gun here in Canada. 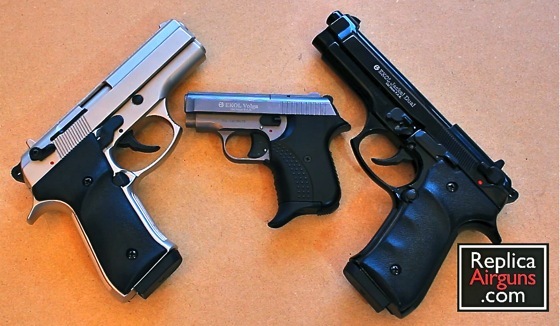 Today I bring you three models, two front firing blank pistols from EKOL in Gloss Black (Arda and Dicle) and one Italian made top venting Bruni Model 92 in Chrome. Like new condition and may have never been fired! Comes with hard case and manual. Checkout my full video review of a similar EKOL Arda. Check my full video review of a similar EKOL Dicle. If you want more than one of these blank guns, please bid on each gun individually. You have till Friday May 11th midnight to get your top bid in place. Once the top bidder has been selected I will send them an email to notify them that they are the top bidder and Payment will be required within 24 hours or the next top bidder will be selected and notified. If you live in the US then simply order blank guns from our US Replica Airguns Store! Checkout my Youtube Video about this silent auction with some closeup video of each blank gun. Another slap in the face to my Canada Customers :( But for my US customers this is great news, I pretty much added the entire EKOL - Voltran linup of blank guns in a variety of styles and finishes to the US Replica Airguns Store. Many of you have asked if we would be making the EKOL Dicle available for purchase in the Replica Airguns Store and now I am happy to say we do have it in both Gloss Black and Satin finish. 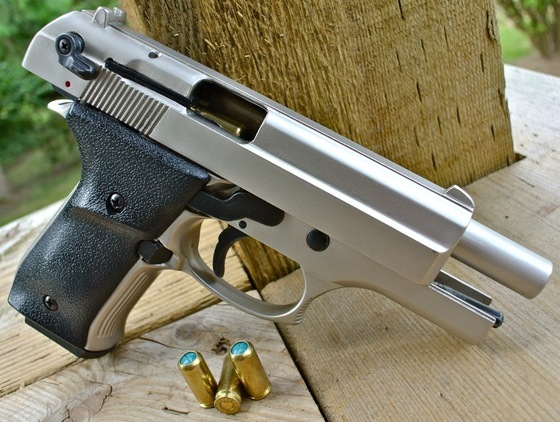 The EKOL Dicle is a beefy 9mm P.A.K. 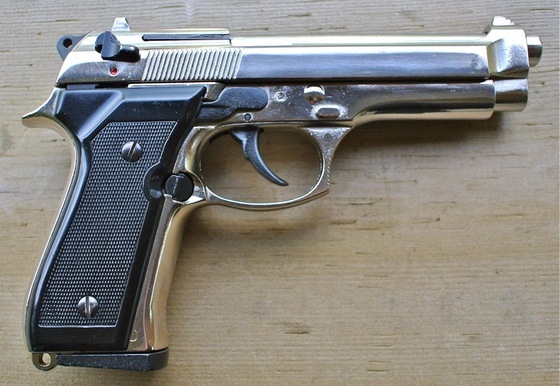 blank shooter with a heavy slide that closely resembles the Beretta Cougar semi auto pistol. Barrel: Semi plugged - front firing. Action: Semi auto single & double action. Ammunition Type: 9mm P.A.K. blanks. Ammunition Capacity: 15 round magazine. 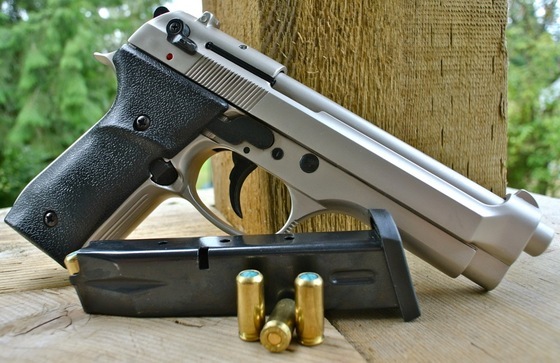 Trigger Pull: The trigger pull of the Dicle is fairly heavy in double action mode, even cocking the hammer takes some effort, but once the hammer is back the single action mode is much lighter. I have not put many rounds through this gun and have found the EKOL's take some breaking in before they loosen up a bit. Build Quality: The build quality is similar to that of my Zoraki blank guns. The EKOL Dicle is well built and uses good quality materials, this gun is almost all metal and very heavy with a thick slide and heavy frame. The finish quality is typical of other Turkish guns - good but not perfect. 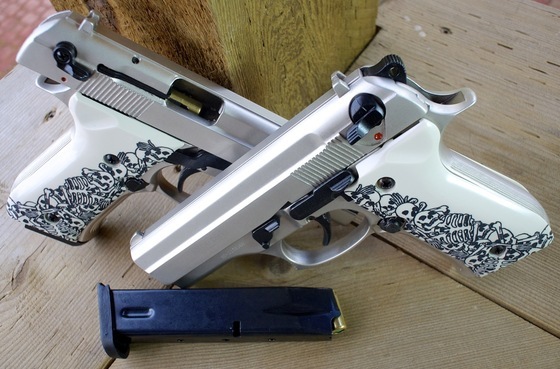 The two tone look suits this gun and brings out its features. 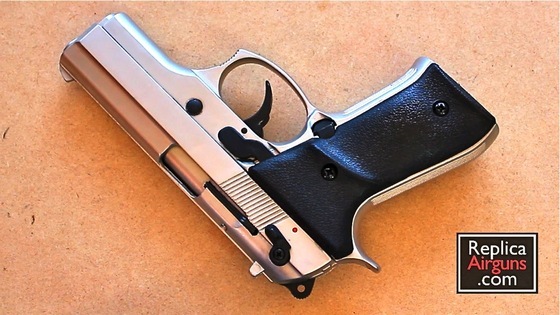 Realism: The EKOL Dicle is not an exact copy of the Beretta Cougar, but it does look very similar with the exception of the elongated thumb guard. Purchase From: The Replica Airguns Store. Very good construction, lots of metal parts and good solid weight to the Dicle. The two tone finish really suits this pistol. Worked very well, no jams, misfires or failure to eject or load. Looks very much like the Beretta Cougar. Plastic grips are a bit cheap looking. The plastic but piece at the bottom of the magazine seems a bit cheap and out of place with the rest of this well made gun. A bit of a bulky gun, may be a bit too much gun for some people. 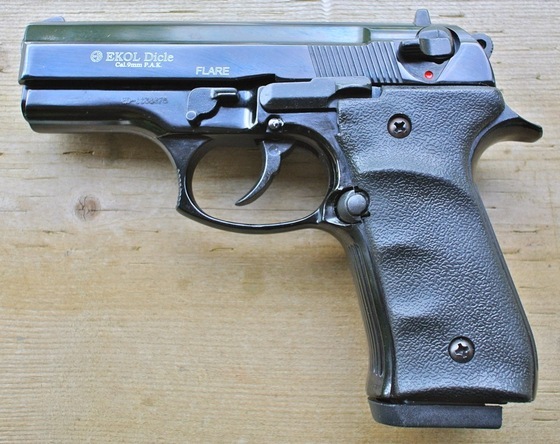 The EKOL Dicle blank gun is a nice addition to our growing number of legal blank guns in Canada. EKOL offers a nice variety of models to choose from with an assortment of finishes. I was not expecting to like the Dicle as much as I did, in photos you just can't fully appreciate how solid this gun really is. The quality and finish is pretty good overall with the usual few minimal cosmetic imperfection found on many Turkish blank guns. This gun test fired without incident, I shoot several rounds through it and had no miss fires, failures to load or eject. I finally got to shoot my new EKOL blank firing 9mm P.A K. guns today and I just happened to have my "cameras" rolling: My Canon T2i DSLR and my Casio EX-FC100 high speed camera. First off I was very impressed with how these EKOL blank guns performed, this was my first time shooting all of them and they all shot every round without a misfire, jam or loading problem. I was using Fiocchi 9mm P.A.K. blank ammunition by the way. Make sure to watch this one, there's lots of action, some full auto, a bit of slow motion and even some full contact! Weight: 2.5 - 2.5 - 1 pounds. Action: Semi/full auto single action - Semi auto single/double action - semi auto single action. Ammunition Capacity: 15 - 15 - 6 round magazines. Trigger Pull: The trigger pull for the Jackal Dual and Dicle is fairly light to medium in weight and with the Volga it's a bit harder with more of a medium to heavy trigger pull. I have noticed it getting lighter over time as I work the gun in. Build Quality: The build quality is similar to that of my Zoraki guns, I have not shot the guns so I can not say yet how they will chamber and fire rounds, but my first impressions after spending some time looking them over and handling them is that they are well built and use good materials. There finish quality is typical of other Turkish guns - good but not perfect. Realism: The EKOL Jackal Dual is the most realist of the three guns, and I say that because it closely resembles the Beretta 92 FS. 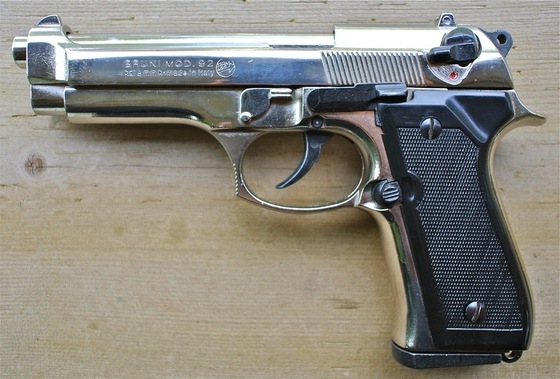 And it does look very much like the Beretta 92 FS in many ways. The Dicle and the Volga however do not closely resemble any other guns that I can think of. 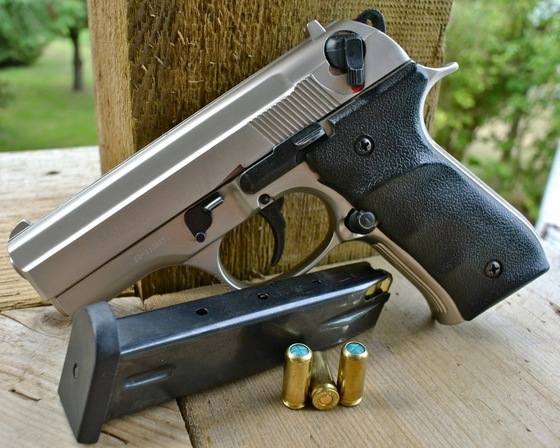 The closest gun to the Dicle I would have to say is the Beretta PX4, but the Dicle is more like a PX4 and a Sig Sauer combined into one gun. 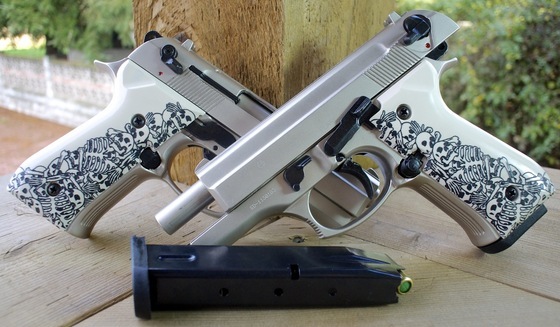 The Volga is similar in design but not spot on to other small .25 Automatic sub compact pistols. In Canada these guns are some of the few blank guns available for purchase that are not prohibited. Very good construction, lots of metal parts and good weight to these blank guns. EKOL has a nice assortment of styles and colors to choose from. 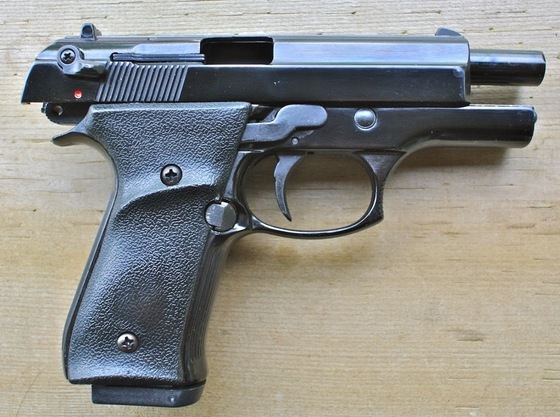 In the case of the Jackal, this gun would make a good Beretta 92 FS blank shooting replica. Great training guns, as they operate exactly like real guns without the deadly force. Jackal Dual's rear safety is non-functioning, this is a bit confusing. 9mm P.A.K. Blank ammo is expensive. Volga's trigger pull is a bit heavy but it seems to be getting better over time. Hard to get an empty magazine out of the Volga when the slide is back. 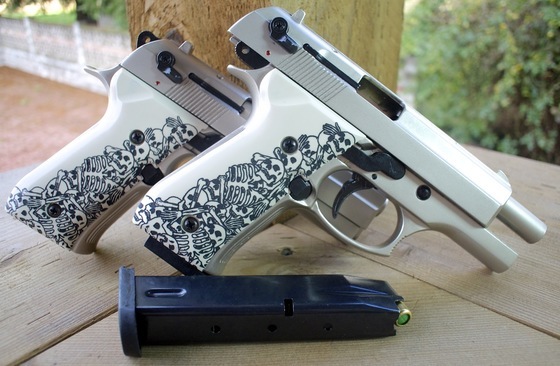 These EKOL VOLTRAN blank guns are a nice addition to our growing number of legal blank guns in Canada. EKOL offers a nice variety of models to choose from with an assortment of finishes. The quality and finish is better than I expected from EKOL, almost matching the Zoraki products and that's a pretty high pedestal to achieve. 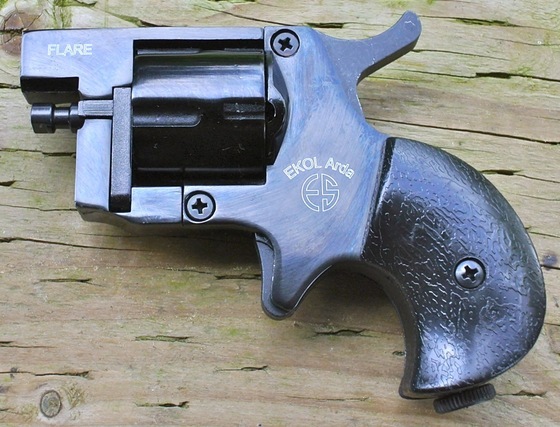 If you are thinking about getting a blank shooter, definitely take a look at the EKOL VOLTRAN line of blank guns. 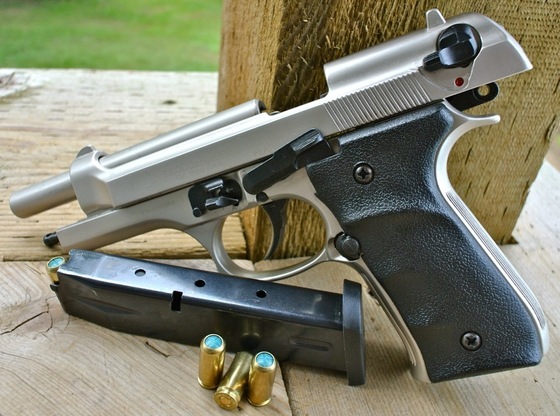 One of my viewers mentioned that the EKOL Volga looks a lot like the Tanfoglio GT27. As I mentioned with my two new BB guns, my mailbox yesterday was teaming with goodies! I also received three new EKOL (Voltran) Blank Guns. The EKOL Jackal Dual, Dicle and the Volga. 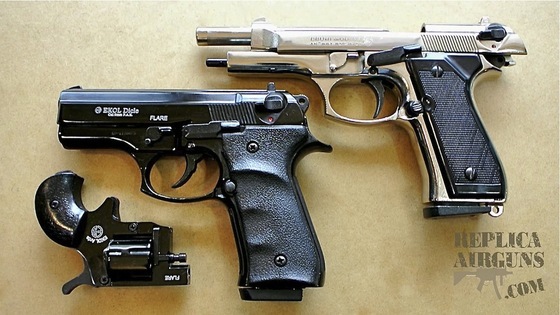 The Jackal is basically a Beretta 92 FS Replica while the EKOL Dicle and EKOL Volga do not look super close to any one particular pistol. They are all 9mm P.A.K. front shooters, I decided to purchase mine in a variety of different finishes: Gloss black, Satin, and Fume. I have not had a chance to shoot these guns but initially I am very pleased with the overall quality and finish, like my Zoraki Blank Guns, they are also made in Turkey. The Beretta look alike Jackal Dual is both semi and full auto selectable, and is really a very solid gun with a beautiful glossy back finish. Probably the nicest finish out of the three. 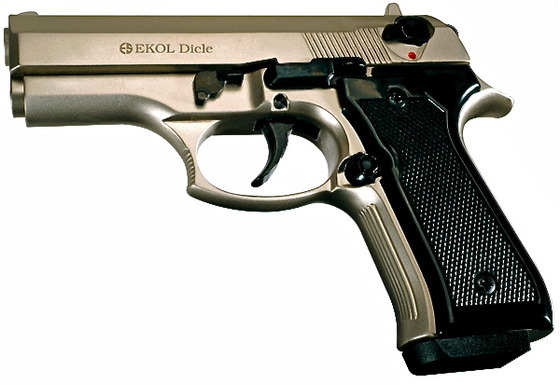 The EKOL Dicle (not sure who named this gun) kind of looks like a gun that a Sig Suaer and Beretta PX4 gave birth to! It really looks in many ways like a bit of both of them. Again I was impressed with how solid this gun was. I really like the two-tone satin look of this blank shooter. My EKOL Volga looks a bit like a Titan E27 .25 Automatic in some ways and again has a two-tone look but not as drastic as the Satin finish on my EKOL Dicle. This blank gun is even smaller than my Zoraki M906 yet still chambers six 9mm P.A.K. blank rounds in the magazine.